Avnet, Inc. and Arrow Electronics have long dominated the electronics distribution market. With shared lineages in the radio industry, similar business models, and recent forays into enterprise computing, the two companies are neck-and-neck rivals. But financial strength isn't the only indicator of a good company. Let's take a closer look at the world first and second largest electronics distributors. Avnet, Inc. is the world’s largest distributor of electronic components. The company is headquartered in Phoenix, Arizona, and has over 400 locations worldwide, with 19,000 employees and more than 100,000 customers. Avnet is ranked 117 on the U.S. Fortune 500 list, with approximately $27.5 billion in revenues in FY 2014. Services: Component distribution, supply-chain, design-chain, logistics solutions, product assembly, device programming, computer system configuration, and integration, financing, and marketing. Markets: Lighting, military & aerospace, transportation, power, sensors, and thermal management. History: Despite its numerous achievements, Avnet’s beginnings were relatively humble. In 1921, as radios were becoming common household items, 33-year-old Russian immigrant Charles Avnet began distributing surplus radio parts, eventually building enough capital to open a storefront. After weathering the Great Depression and recouping resulting losses through WWII military sales, Avnet tapped into the connector market and watched its business explode. By 1959, Avnet had gone public. It also was among the first companies to introduce overnight delivery as an industry standard. In 1962, Avnet aquired Hamilton Electro Sales, a west coast electronics distributor lead by Avnet's future CEO Tony Hamilton. By 1968, after a series of additional key acquisitions, Avnet--specifically, Electronic Marketing Group (Hamilton/Avnet)--had established itself as the largest electronics distributor in the nation. In the 1970s, Avnet shifted its business operations away from military products and toward newer ventures that were brewing in Silicon Valley -- namely, microprocessors. Just a year before, in 1969, Avnet was the first technology distributor to place an order with Intel. It had also forged relationships with major semiconductor suppliers, such as Motorola, Fairchild Semiconductor, RCA, and Signetics. Throughout the 70s and 80s, Avnet refocused its business strategy, dropping sluggish business divisions and replacing them with technology-related enterprises. This effort was largely spearheaded by Tony Hamilton, who was named CEO in 1980 and who championed Avnet's primary role as an electronics distributor in the coming age of high-tech. As Electronic Marketing Group (nicknamed Hamilton/Avnet) was responsible for more than 75% of Avnet's revenue, Avnet came to be known popularly as Hamilton/Avnet, and even further as "Hamilton." By the 1990s Avnet had expanded globally. It became a major pioneer in supply chain solutions with its introduction of computer-based shipment tracking, especially under the guidance of then-President Leon Machiz, who transformed Hamilton/Avnet Electronic Marketing Group from a system of stocking, sales, and support facilities, into a highly efficient constellation of technologically integrated megawarehouses, field support hubs, and local sales branches.Since 2005, Avnet has seen steady year over year growth. Avnet has a long tradition of moving in the right direction at the right time. Like its investment in connectors and microprocessors, Avnet is now tapping into emerging technologies such as “the internet of things,” big data, and smarter grids. Specifics: While Avnet’s capabilities are both numerous and diverse, its electronics distribution business is its core enterprise. With more than 800 suppliers and 400 locations worldwide, the global powerhouse ships more than 30,000 line items per day to more than 100,000 customers. It has been named the world’s most ethical company by Ethisphere institute, and is consistently included among Fortune’s most admired companies. Avnet’s business is divided into two primary segments. The first, Electronics Marketing (EM), distributes electronic components and embedded systems to OEMs and EMS providers, as well as design- and supply-chain services. The second, Technology Solutions (TS), is Avnet’s enterprise computing segment, which collaborates with customers and suppliers to create and deliver services, software, and hardware solutions to address business needs. In FY 2014, Avnet revenues were approximately $27.5 billion, up 8% from the previous year. Its EM segment's revenues were $16.5, up 9.6% over the previous year (organic sales increased 8.2%, which is primarily related to grown in its EMEA and Asia regions). TS's revenues were approximately $10.9 billion, up 5.7% over the previous year (organic sales remained flat). Avnet achieves most of its growth through acquisitions. Glassdoor: Based on 122 reviews on Glassdoor.com, Avnet received 3.5/5 stars, with 48% of respondents recommending the company to a friend. Based on 42 ratings Avnet CEO, Rick Hamada, received a 64% approval rating. Arrow Electronics is the second largest distributor of electronics components in the U.S. The company is headquartered in Inverness, Colorado, and has more 460 locations worldwide, with 17,000 employees and more than 100,000 customers. Arrow is ranked 138 on the Fortune 500 list. Its revenues were approximately $22.8 billion in FY 2014. Services: Component distribution, enterprise computing solutions (ECS). Markets: Embedded, aerospace & defense, industrial automation, lighting, machine-to-machine, OEM computing solutions, PEMCO, power supplies, alternative energy, custom logic solutions, medical, transportation/automotive. 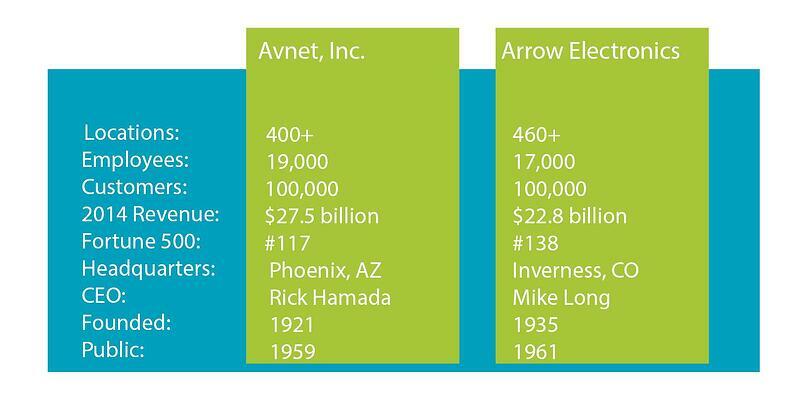 History: Arrow and Avnet have been neck and neck competitors since their beginnings on Radio Row in the 1930s. Like Charles Avnet, Arrow’s founder, Murray Goldberg, sold used radios and radio parts to retail customers, eventually building enough steam to sell new radios. Unlike Avnet, however, Arrow did not achieve major growth through the WWII war effort. Instead, the company continued to strengthen its presence in consumer markets, forging deals with RCA and Cornell Dubliner. In the 1950s/60s, Arrow moved into the industrial market, moved its headquarters to Long Island, and opened more branches. In 1961, Arrow went public. At this time, more than half of its sales came from its industrial sales division. In the 1970s, with wins of major franchises, such a Texas Instruments, Arrow experienced a surge in growth. It opened sales offices in more than 20 U.S. cities and grew its distribution business at an average annual rate of 34%. By the end of the decade, Arrow was the U.S.’s largest distributor, behind Avnet. Further growth was fueled by a 1969 acquisition of Schuylkill Metals Corporation, a leading recycling company, which was later sold in 1987. The 1970's saw more growth through aquisitions, although much of it relied heavily on public bond offerings, which left Arrow heavily in debt. Still, the company doubled its revenues and was finally able to claim a national presence. In 1979, Arrow was listed on the New York Stock Exchange. In 1980, however, that all came to a crashing halt. Thirteen of Arrow's senior executives were killed in a hotel fire in Harrison New York. This, coupled with an industry downturn, caused Arrow's stock prices to plummet. But Arrow eventually recovered, and that recovery is largely attributed to the business savvy of Steve Kaufman, who was named CEO in 1986. Under his leadership, Arrow was lifted from the doldrums with an aggressive growth strategy, completing more than 50 acquisitions, including the third- and fifth-largest companies in the market. Throughout the 1990s Arrow consolidated its component distribution business, expanding globally. It also began distributing computer products. After multiple changes in leadership throughout the 00s, Michael J. Long became Arrow’s CEO. He has steered the company through 35 strategic acquisitions since his appointment, which has helped to expand Arrow’s global component and computer systems business, as well as its unified communications, reverse logistics and end-of-life management capabilities. Arrow has retained its place as the world’s second largest component distributor. Specifics: Arrow is Avnet’s closest direct global competitor, offering electronic distribution services and enterprise computing solutions to hundreds of thousands of global customers. Like Avent, Arrow’s operations are divided into two main segments. The first is called “global components,” the sales of which includes the company's semiconductor products (66%) and related services; passive, electro-mechanical, and interconnect products, consisting primarily of capacitors, resistors, potentiometers, power supplies, relays, switches, and connectors (20%); and computing (9%). The second, Enterprise Computing Solutions (ECS), provides enterprise computing and midrange computer products to VARs in its three main operating regions: Americas, EMEA, and Asia Pacific. In FY 2014, Arrow's revenues were approximately $22.8 billion, up 6.2% from FY 2013. Its global component business earned approximately $14.3 billion in revenue, up 6.1% from the previous year. Its ECS segment's revenues were approximately $8.5 billion, up 7.6% from the previous year. Glassdoor: Based on 326 reviews on Glassdoor.com, Arrow Electronics received 2.9/5 stars, with 38% of respondents recommending the company to a friend. Based on 177 ratings Arrow CEO, Mike Long, received a 52% approval rating.